Last night the rain eventually stopped after tea. Having been cooped up all day we took ourselves off for a walk. On our return we met up with our mooring neighbour Linda on nb Canbedun..Again. She was off to look at the sluice nearby for a check of the water flow so we joined her. 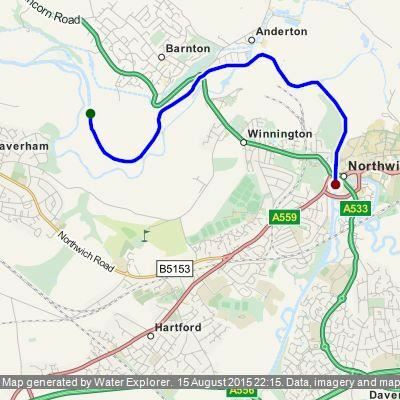 A two mile round trip had us chatting all the way and relieved not much flow was running over the sluice. Our mooring last night at Barton Cut. This morning the sun put in an appearance so we set off. 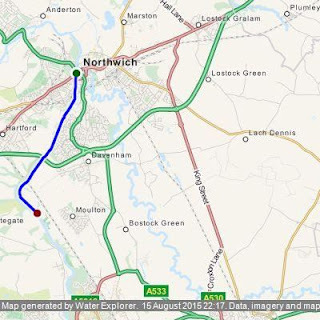 We needed a shop so the plan would be to stop off in Northwich. The river on the way into Northwich takes on a rather run down industrial look that seems at odds with the lovely stretches up to now. A little further Winnington bridge came into view. Head room is only 8feet 10inches so we kept to the left as we passed under. The left side is higher than the right. Just outside Northwich stands the second reason for our trip, the Anderton Lift. We will be returning home via the lift later next week but for now we passed it by. We could see two boats descending in one caisson as we slowed to watch as we passed by. A bit further on and we found this sunken barge that now looks more like an over sized planter. We arrived at Northwich to find mall the visitor moorings downstream fenced off and scaffolding making it difficult to get ashore though no apparent reason for them being so. All the mooring bollards were also boarded off so it was obvious these moorings were unavailable. There are a few visitor moorings on the right between Town and Hayhurst swing bridges and we managed to stop in the last available space opposite the new marina moorings. We walked into town and strolled round the indoor market where I bought a small scythe that I could cut back the vegetation when we moor. We stopped for some lunch in Weatherspoons then headed for Sainsburys for our shop. We bought rather more than we intended so had no choice but to hail a taxi to take us back with the shopping. I seem to remember we did this in Middlewich a while back. As the weather was still fair and only 2pm we decided to make for Vale Royal as we knew Richard and Sharron on Oakapple were moored there. They had texted us earlier in the week and again today so we let them know we were on our way. We dodged around the work boats at the C&RT depot then passed Yarwoods yard. I think this is where Joe and Lesley might have had nb Yarwood built. This barge was having work done but we could not see what. Before leaving Northwich I had telephoned the lock keeper at Hunts lock to book us through and this was ready for us when we arrived as a boat was just leaving the lock. Here the lock keeper insisted Chris stayed in the boat and not out on deck, asking for our centre line. Seems a few months ago a woman on the roof of her boat had fallen into the lock whilst it was filling and had been swept under her boat. Fortunately she survived the ordeal but this had shaken the lock keeper so much that he now took these extra precautions and rightly so. Hunts lock is the deepest at 11 feet and feel quite foreboding when in it due to the rows of blocks jutting out. Beyond Hunts lock and away from the confines of the town the river returns to its scenic personality with trees lining the banks once more. The odd bridge interjects the views as one cruises on towards Vale Royal. The viaduct is almost hidden by the trees. After 30 minutes our last lock of the day came into view. The Hunts lock keeper had phone ahead letting this keeper know of our arrival, however, the closer we got the lock it looked closed and full. A working boat was moored on the lock landing so I slowed AmyJo to a halt waiting for the lock to open. After a few minutes I noticed the lock keeper waving us round to the side of the lock towards what looked like a weir. It was only when we got close to the caisson we realised the smaller lock was hidden from view around the corner. Now the second lock comes into view and all is revealed. It was then a pleasant short run down to the moorings where we found Oakapple moored. Richard and Sharon came out to greet us and helped us to moor up. After getting tidied away we spent a lovely couple of hours on board Oakapple with glasses of wine having a good catch up. The last time we met them was at Wharton Lock near Tattenhall last year so its really good to see them again. we got under New Bridge recently with no trouble, didn't even have to take the can off the roof. Why not cruise up and give it a try if the river levels haven't gone up? We're moored at Vale Royal moorigs so will take a walk to scope out the bridge. If its too low Richard and Sharon on Oakapple have kindly offered us a lift with them which we will gratefully accept. Thank you Linda, and its been lovely to meet you too. Hope we'll see you again somewhere.